Boone is a well known Promise Keepers speaker and has his own campus outreach ministry. The emphasis is the same as before: jumping from the spiritual to the social. Boone adds a heavy charismatic influence to his approach, receiving the second blessing when the Shekhinah glory entered his bedroom (187). 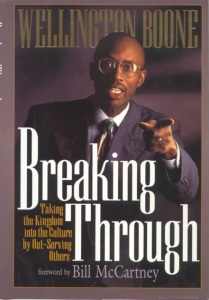 Interestingly, he connects the racial reconciliation movement to the Azusa Street revival of 1906 and resultant Pentecostal movements.Boone writes, “Whites, as they look out in repentance [?] may identify with the sins of the forefathers as Jesus identified with Adam’s transgression (69).” He seems to suggest that Christ’s ability to atone for sin was simply in his ability to identify with the race. This, then, becomes our ministry as well.